Wisconsin Badgers forward Frank Kaminsky (44) shoots a three over Arizona center Kaleb Tarczewski (35) in overtime at the Arizona vs. Wisconsin game at the NCAA West Regionals in Anaheim, Calif., on Saturday, March 29, 2014. Arizona lost 64-63. Wisconsin Badgers forward Frank Kaminsky (44) shot fakes Arizona center Kaleb Tarczewski (35) and Arizona forward Aaron Gordon (11) in overtime at the Arizona vs. Wisconsin game at the NCAA West Regionals in Anaheim, Calif., on Saturday, March 29, 2014. Arizona lost 64-63. Arizona forward Aaron Gordon (11) looks for room under the basket around Wisconsin Badgers forward Frank Kaminsky (44) during the second half of the Arizona vs. Wisconsin game at the NCAA West Regionals in Anaheim, Calif., on Saturday, March 29, 2014. Arizona lost 64-63. Wisconsin Badgers forward Frank Kaminsky (44) takes it to the bucket over Arizona forward Rondae Hollis-Jefferson (23) in overtime at the Arizona vs. Wisconsin game at the NCAA West Regionals in Anaheim, Calif., on Saturday, March 29, 2014. Arizona lost 64-63. Wisconsin Badgers forward Frank Kaminsky (44) celebrates after overtime at the Arizona vs. Wisconsin game at the NCAA West Regionals in Anaheim, Calif., on Saturday, March 29, 2014. Arizona lost 64-63. Wisconsin Badgers forward Frank Kaminsky (44) celebrates with his teammates in overtime at the Arizona vs. Wisconsin game at the NCAA West Regionals in Anaheim, Calif., on Saturday, March 29, 2014. Arizona lost 64-63. UW's Frank Kaminsky shoots against Arizona center Kaleb Tarczewski in the first half. Kaminsky scored a game-high 28 points. ANAHEIM, Calif. — Sam Dekker was standing next to Kaleb Tarczewski while someone shot free throws Saturday night, talking to Arizona's sophomore center about — who else? — University of Wisconsin center Frank Kaminsky. "Frank is a very effective player and we run our stuff through him for a reason, because he's been so good and he's been carrying us." On an unforgettable Saturday night at the Honda Center, Kaminsky carried the Badgers all the way to the Final Four. The 7-foot junior scored 28 points, grabbed 11 rebounds and raised his voice at someone other than himself as UW outlasted the Wildcats 64-63 before 17,814 fans who watched an Elite Eight classic that was wilder than a Craig Sager sport coat. "Frank Kaminsky is the reason Wisconsin's in the Final Four," Arizona coach Sean Miller said. It was load that Kaminsky decided late in regulation that he was ready to bear. "In one of the timeouts, I was just ... I didn't want to lose," Kaminsky said. "No one wanted to lose. I was screaming in the timeout. I think there was 3 minutes left (in regulation) and I'm like 'Three more minutes & we got this.'" It took eight, but Kaminsky capped a remarkable turnaround from a guy who was little more than a role player last season to the NCAA West Regional MVP. Kaminsky answered a pair of Arizona baskets in overtime with ones of his own to help the Badgers keep a lead they acquired when Ben Brust opened the overtime with a 3-pointer. Kaminsky's tip-in with 1:08 to go put UW up 64-61 and proved to be the game-winner after Jordin Mayes' tip-in for the Wildcats on the other end to cut margin to one, followed by 58 of the longest seconds in UW history. "We've had a lot of big guys over the years improve," UW associate head coach Greg Gard said. "I can go through the list — (Brian) Butch, (Greg) Stiemsma, (Jon) Leuer, ... (Keaton) Nankivil, (Mike) Wilkinson. But (Kaminsky) mentally has taken a big jump. That's been the biggest thing with Frank this year is that he's mentally matured to the point where he can use his skills." Traevon Jackson hit a jumper with 1:08 left in regulation that looked like it might hold up as the game-winner. After Rondae Hollis-Jefferson got behind Nigel Hayes for a putback dunk with 31 seoncds left to tie the game for Arizona, Jackson went back to work on the other end. This time, his 17-foot jumper missed the mark and the teams took their thriller to overtime. The NCAA did not allow a pool reporter to ask the officials about the lengthy video review of UW’s final possession that resulted in a reversal of an out-of-bounds play. Josh Gasser attempted to inbound the ball to Jackson with 3.2 seconds left. An Arizona player made a play on the ball, which went out-of-bounds with the officials initially ruling that it went off of the Wildcats' player. A length review determined the ball went off of Jackson and possession went back to the Wildcats with 2.3 seconds left. There were 14 camera angles available and an NCAA representative said “numerous” angles of the 14 were reviewed before the initial call was reversed. Evan Anderson reprised his role as the dancing king on the Honda Center court as UW celebrated its win before receiving the trophy and cutting down the nets. But those honors in the locker room went to long-time equipment manager Otto Puls. A welcome home for the Badgers will take place once the team arrives home Sunday, at approximately 4 p.m. at the Kohl Center. A short program will follow their arrival featuring the team and head coach Bo Ryan. ... Joining UW guard Traevon Jackson and Kaminsky on the all-tournament team were Nick Johnson and Aaron Gordon of Arizona and Xavier Thames of San Diego State. ... Kaminsky’s 28 points are the second-most by a Badger in an NCAA tournament game behind Michael Finley’s 36 vs. Missouri on March 19, 1994. His 11 field goals made are a UW NCAA record, surpassing the mark held by Bobby Cook (vs. Navy, 3/22/47) and Tracy Webster (vs. Missouri, 3/19/94). 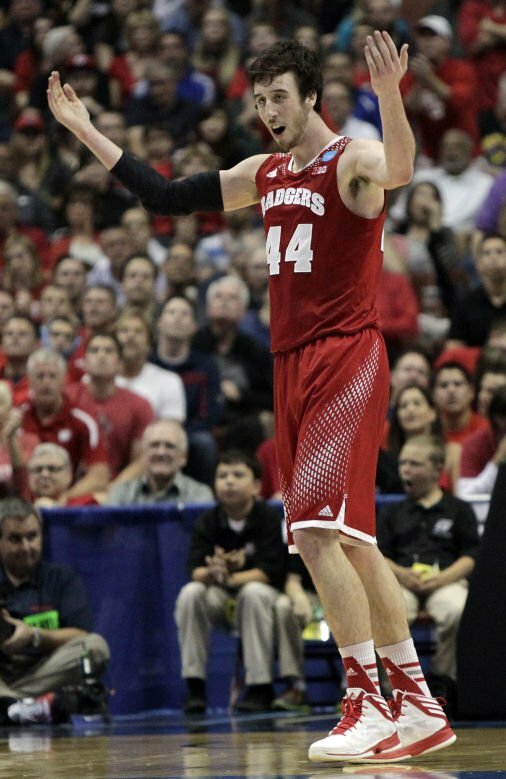 Badgers player Frank Kaminsky gained much attention for his incredible performance in the NCAA tournament.